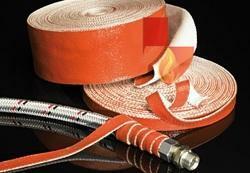 Smart-Shield Self Fusing Silicone Tape is a unique adhesive free product that quickly fuses to itself to create a moisture and corrosion resistant continuous seal for electrical insulation, pipe and hose repair, or anywhere a quick and residue free wrap is needed. Our Silicone Tape creates an airtight/watertight seal around even irregularly shaped applications, and the high insulation values make it useful in repairing cracked or damaged insulations They bond irreversibly to provide an insulative barrier that is resistant to moisture, oxygen, ozone and corona over a wide temperature range (-54°C to 260°C). Ideal on wires or hoses, as a residue free solution to coil extension cords, ropes, and cables, and for a waterproof, heat and chemical resistant wrap for wiring harnesses and splices. Silicone Coated Fiberglass Rope is fabricated from knitted type or braided type E fiberglass and then coated with a high grade high-temperature silicone rubber. 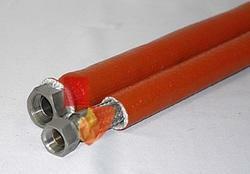 The rope can be partially or completely coated (partially coated rope allows for gluing or other methods of fastening). This rope can also be fabricated into a closed ring and is ideal for many gasket and sealing applications on boilers and similar industrial appliances. This high-temperature rope is most often used as a seal where a high degree of air or gas or liquid tightness is required. It is designed to be used as a seal in environments that are exposed to the hazards of high heat and occasional flame or molten metal splash, slag, sparks and contamination. 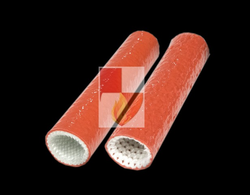 Designed to provide a seal in environments that are exposed to the hazards of high heat and occasional flame. Made of square / Round type E-glass, then coated with a high grade silicone rubber. Resistant to hydraulic fluids, lubricating oils, and fuels, providing an excellent high temperature seal for a variety of industrial uses. 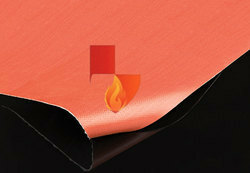 500°F / 260°C continuous rating with weld splatter / molten metal splash protection. 2200°F / 1205°C for periods up to 15 minutes and short excursions to 3000°F / 1650°C. Lager size ropes can also be coated. Looking for Silicone Coated Fiberglass Products ?